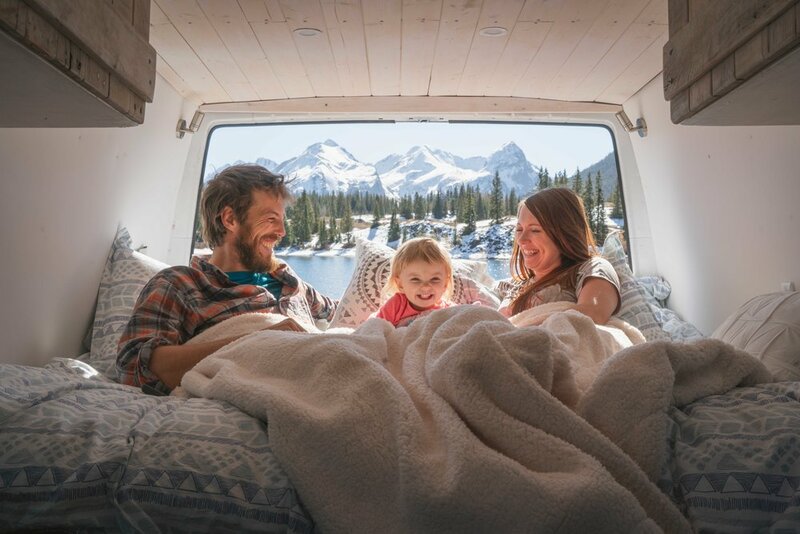 Traveling in a van was our dream for a long time but we also couldn’t commit to getting one for a while because of the cost and time it would require to convert it. When it was still just the two of us we enjoyed traveling in our 4Runner, and sleeping on our self-built platform in the back of it. It was a nice setup even though cooking in rainy and cold weather outside was always a challenge. When Zoey was born we couldn’t keep the platform permanently in the back of our 4Runner because her carseat was there, so we were sleeping in a tent instead. Then last winter we went to New Zealand for several months and bought a van for the duration of our trip. That was the turning pointer us because we fell in love with ease and comfort of traveling in a van, especially because we are traveling with a small child. After that trip we started actively looking for a van and figuring out how to make our dream come true. First of all, I want to explain why we decided to go with a van vs trailer, Airstream or RV. Big reason for us was maneuverability and high clearance. Trailers, Airstreams and RVs simply can’t make it to a lot of backcountry roads and trailheads where a Sprinter can. We also needed to have a good gas mileage since we are planning to travel very long distances. In fact, our Sprinter gets better gas mileage than our 4Runner (22 mpg). Another important reason is that a van is more stealthy than other options. Sometimes we use pull outs or parking lots, and, while not illegal, we still don’t want draw attention to ourselves and look like we are camping. Those were our main reasons for going with a van. We might have less space than some other options(Airstream, RV) but to us it’s totally worth it. What kind of van should we get? We considered different kinds of vans but after doing a bunch of research and talking to some van owners we decided that we wanted to get a Sprinter. The reasons were the space that it offers, great engine, good gas mileage, more stealthy than other vans, and it’s also very customisable. We were specifically looking for T1N First Generation Sprinter years(2003-2004) because they are, obviously, cheaper than newer Sprinters, and, most importantly, they have very good diesel engines that are nicknamed “The Half a Million Mile Engine”. Also, we wanted a longer(158” base) Sprinter so that we could have more space for the three of us. Another choice we had to make was between 2WD and 4WD. We decided to go with a 2WD because the van is cheaper, more reliable and gets better gas mileage. Nonetheless, we did plan on driving a lot of rough dirt roads, and also in snowy conditions if necessary so we purchased bigger off-road tires. We found our van on Craigslist. It came with 155,000 miles on it. Before buying this Sprinter we had to do full inspection at the mechanic to make sure it was in good condition. There was little maintenance that had to be done on the van but we felt that it was a good deal so we went ahead and bought it. It was an exciting and memorable day of our lives. One of the many reasons we decided to build out a van and not purchase a premade camper van, camp trailer, or RV is because we could fully customize the layout to fit our own specific needs and make it feel like home. To start this process we made a list of the things we felt we needed to have in the van. Once we had this list we spend hours and hours and hours watching Youtube videos, reading blogs and examining photos of other people’s Sprinter van layouts, and how they incorporated the features that we wanted in their vans. Thru this process we also found other things that we hadn’t thought about including in our layout. I wanted to include components of our van that we find essential for our travel and lifestyle on the road. We’ve been traveling and testing everything out for several months now so I thought it would be good to write how I feel about each of these items. It’s important to us to be able to cook and eat healthy fresh meals while we travel and wherever we stop. Not only heaving fresh produce with us allows us to eat well but it also saves us a lot of money because we rarely eat out. This fridge is very spacious, and we can fill it up with fruits and vegetable and other produce, and not worry about restocking for several days. Also, in my opinion, top loading fridge is the only way to go in a van because it’s very comfortable to use on daily basis and nothing falls out of it. We were debating at the very beginning if we wanted a permanent stovetop or just use a camping two-burner stove that we already have and just store it in a drawer. I am glad that we decided to install a permanent stove top because we use it all the time, and it makes it very convenient to warm up water for a hot drink or some leftovers for lunch even if we stop only for a few minutes at a gas station. It was a must-have for me to include a deep sink in a van. I didn’t want water splashing everywhere while washing the dishes, and I also wanted to have a sink big and deep enough to be able to give a bath to our daughter Zoey. This fan is simply amazing. We wanted a durable fan with a hood that we could use even in the rain, and that wouldn’t brake when driving if we forget to close it. This fan truly has been an essential component for our living in a van. It does a great job of pulling the air in and out of the van when cooking or when it’s hot, and in general for air circulation. Since we like to camp for free in remote places or random pullouts with no facilities, installing a toilet was a must for us. We’ve been using it daily and we are very happy that we have it. I honestly can’t imagine traveling in a van without it now. It doesn’t smell, and we just need to empty urine bucket every couple of days, and empty and change compost every 3-4 weeks. Installing this diesel heater was a total game-changer for road tripping during cold winter months, and we think it is worth every penny we spent on it. It consumes only a small amount of diesel, it is safe and shuts down and turns on automatically to maintain desired temperature, and its also not very noisy. We are very happy with this heater especially because we don’t have to worry about our daughter getting cold during the night. It’s very important to us to have a quality rest before and after our adventures because it makes a huge difference. Or I better say that quality sleep is important all the time. This mattress is super comfortable, and we already had many good nights of sleep in our van. I don’t know many technicalities about this mattress but I do love it and definitely recommend it. Being self-sufficient on the road, and be able to go off the grid and still have power for several days was necessary for our lifestyle. Having power from the sun to keep all our gadgets charged and the lights on at night is like magic. As long as the sun shines the power never runs out. This is basically the heart of the conversion where all power flows from and makes everything run. The Vmaxx Tank batteries are the best AGM batteries on the market and with 700 amp hours we can go 5-7 days without power from the sun, which was especially important to us coming from the PNW where it rains a lot and it’s dark during winter days. This inverter allows us to run almost any home appliance (A/C powered) that we would need. We got it primarily to run our Vita Mix but now we also constantly use it to power our Instant Pot, blow dryer and charge electronics. We work while on the road, and having internet service is essential for it. Oftentimes, when we travel to remote places weBoost is a big help to improve our cellular signal so that we can stay connected and keep working while being in the nature in the middle of nowhere. Disclosure: Some of the links in this post are Amazon affiliate links. An affiliate means that if you make a purchase, I receive a small compensation at no added cost to you. I only recommend products that I truly use and love, and any purchases you make help me keep this blog going. If you have any questions about products featured in this blog please email me. Thank you for your support. Now to the most interesting part of this blog. The most frequent question we get about our van conversion is about the cost. Before I break it down for you I wanted to say that you definitely don’t have to put in your van everything we did and convent a van for a lot less, or on the other hand you could include and spent even more. It all depends on your budget and personal needs. We definitely invested and poured our time and soul into this van because we wanted it to be beautiful and comfortable like home. Here is the breakdown of what we spent on this conversion. I hope that you will find this information helpful because we were looking for it ourselves at the beginning when we were planning and budgeting. This cost doesn’t include license and registration fees, buyer’s inspection and some maintenance cost. While you can definitely did the conversion yourself for a lot less than outsourcing it, you can only insure the van for the amount of money you put into it but not your time and labor cost. We are very happy how everything turned out in our van, and are extremely grateful to have such a comfortable and cozy home everywhere we drive. We called our van iVan and we hope that he will be our trusty companion on many adventures to come, and will help us create many memorable moments.